Product #60822 | SKU P215-9DSW | 0.0 (no ratings yet) Thanks for your rating! 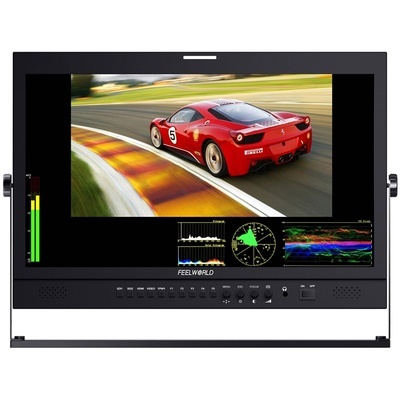 The FeelWorld P215-9DSW 21.5" Broadcast LCD Monitor is an incredibly high quality monitor that's versatile enough to be used from a broadcast facility, mobile live production or on set for a feature film production. The monitor comes with 2x3G/HD/SD -SDI, HDMI, Audio, Video input and output. Multiple input formats to meet all HD, SD, analogue video signal input and display demand Professional functions set. You can view two independent sources simultaneously and conveniently switch between monitoring or scope views whenever you need. Choose from Waveform (RGB parade, YUV parade, Y parade), Vectorscope, Histogram and Audio Level Displays, and get broadcast accurate waveform monitoring that shows everything you need to know technically about your video and audio signals. P215-9DSW removes the need for separate expensive scopes. The P215-9DSW can be powered in two ways: with an DC adapter or lithium batteries. The P215-9DSW has a flexible battery system that supports V battery plate (standard), Anton Bauer battery plate of your choice.